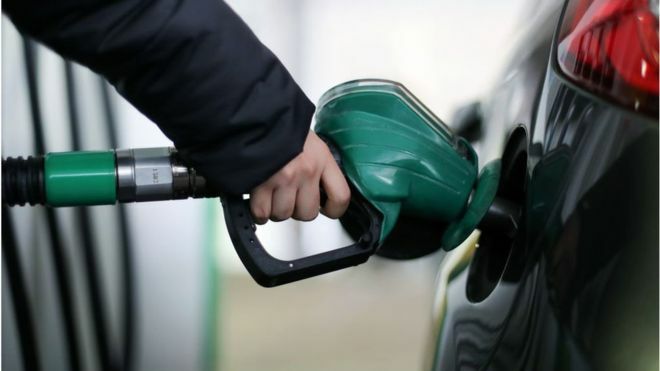 Petrol prices could fall by as much as 3p a litre as a result of falling wholesale prices and a potential supermarket price war, the AA has said. The price of both petrol and diesel is currently at a four-year high, after 11 consecutive weekly price increases. Average petrol prices hit 130.6p a litre this week, while average diesel prices rose to 134.6p a litre. The AA said it was now a question of "how quickly" supermarket forecourts passed on lower costs to drivers. The motoring organisation - which offers advice to drivers - said falling wholesale costs had in the past triggered a forecourt price battle, with supermarkets jostling to offer drivers the cheapest prices. Luke Bosdet, from the AA, said: "Drivers were told earlier this month that there was 'no end in sight' to rising pump prices. "Now, they should be looking for a £1.50-a-tank cut in petrol costs. "The key question is to what extent and how quickly the fuel retailers decide to pass on the savings." He said potential fuel savings had come from a drop in oil refining margins for wholesalers and a recent strengthening of the pound.